Of course I HAD to do a margarita for Cinco de Mayo but you know I'm going to sip it out of a martini glass so meet my zesty Blood Orange Martini-a-Rita! It's a martini glass filled with "bueno". 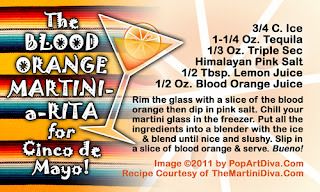 Grab this Blood Orange Cinco de Mayo margarita (martini), some chips & guacamole and find out exactly what you're celebrating on the 5th of May (Cinco de Mayo) on the Cinco de Mayo Cocktails Page.